"He’s just been great to me talking." Pat Cummins has been a whole-hearted trier for Australia and even when the national team has strained to find its feet at the highest level, the 25-year-old hasn’t dropped his intensity. Apart from his incredible performances with the leather, Cummins has also impressed with the bat in hand. In the two-match Test series against Sri Lanka, he was the leading wicket-taker with 14 scalps. Subsequently, he also became the Player of the Series. Recently, he got the prestigious Allan Border Medal in the Cricket Australia awards. Furthermore, he became the second youngest to achieve it after Steve Smith in 2015. In the 12-month voting period, the Sydney-born talent claimed 44 wickets at 25.61 and also pipped off-spin bowler Nathan Lyon, Australia’s Test player of the year. After getting the award, quite expectantly, Cummins was delighted. The youngster credited legendary Aussie fast bowler Dennis Lillee for being a constant support to him. Cummins also revealed how he prefers taking Lillee’s suggestion, surrounding managing his bowling action and even himself. “The main one (support person) for me is DK Lillee. 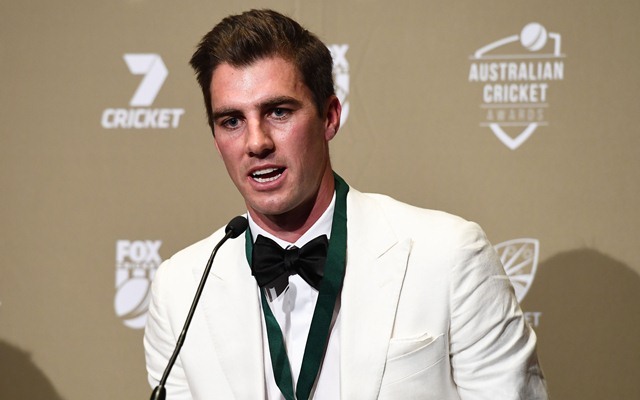 I haven’t actually worked with him too much in the last couple of years, but still pick up the phone and call him quite often and send him footage whenever I feel like things just aren’t 100 per cent right,” Cummins was quoted as saying by Fox Cricket. “He’s just been great to me talking through bowling action and the technical side of things and also how to manage a season. How to manage different wickets. He just has so much support for me, so he’s probably the one that’s been really in my corner the most,” he added. Cummins was recently rested for the ODI series against India but would be a part of both the overseas ODI and T20I series against the Men in Blue that gets underway on Sunday, February 24.